Lego and NASA are continuing their partnership of geek-inspired-awesomeness (GIA) with tomorrow’s (August 5th 2011) launch of the Juno spacecraft. After the excitement and a little sadness (if you are a fellow-geek) of the last Space Shuttle Mission, NASA is moving on to unmanned projects like sending a spacecraft to orbit Jupiter, the focus of this latest launch. As Lego had partnered with NASA to send some of their beautiful bricks on Space Shuttle missions it made sense that they would also make a contribution to the exploration of our larger galaxy as well. Three minifigures were constructed especially for the journey, and reflect the Roman-God theme of the mission – Jupiter (the planet), Juno (the spacecraft) and Atlas (Atlas V-The very big rocket that will get Juno off Earth) are all named after Roman gods. The three figures are Galileo Galilei (the grand-daddy of astronomy and not a Roman God but certainly could be considered a god-like Italian :0) ), the Roman god Jupiter and his wife Juno. As yet we have no word as to whether the figures will make their way into sets (or collectible minifigures). You can watch the launch of Juno and his fellow figures live on NASA TV. PASADENA, Calif. – NASA’s Jupiter-bound Juno spacecraft will carry the 1.5-inch likeness of Galileo Galilei, the Roman god Jupiter and his wife Juno to Jupiter when the spacecraft launches this Friday, Aug. 5. The inclusion of the three mini-statues, or figurines, is part of a joint outreach and educational program developed as part of the partnership between NASA and the LEGO Group to inspire children to explore science, technology, engineering and mathematics. In Greek and Roman mythology, Jupiter drew a veil of clouds around himself to hide his mischief. From Mount Olympus, Juno was able to peer through the clouds and reveal Jupiter’s true nature. Juno holds a magnifying glass to signify her search for the truth, while her husband holds a lightning bolt. The third LEGO crew member is Galileo Galilei, who made several important discoveries about Jupiter, including the four largest satellites of Jupiter (named the Galilean moons in his honor). Of course, the miniature Galileo has his telescope with him on the journey. The launch period for Juno opens Aug. 5 and extends through Aug. 26. For an Aug. 5 liftoff, the launch window opens at 8:34 a.m. PDT (11:34 a.m. EDT) and remains open through 9:43 a.m. PDT (12:43 p.m. EDT). 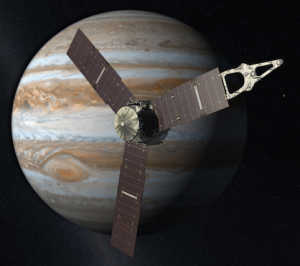 The spacecraft is expected to arrive at Jupiter in 2016. The mission will investigate the gas giant’s origins, structure, atmosphere and magnetosphere. Juno’s color camera will provide close-up images of Jupiter, including the first detailed glimpse of the planet’s poles. NASA’s Jet Propulsion Laboratory, Pasadena, Calif., manages the Juno mission for the principal investigator, Scott Bolton, of Southwest Research Institute in San Antonio. The Juno mission is part of the New Frontiers Program managed at NASA’s Marshall Space Flight Center in Huntsville, Ala. Lockheed Martin Space Systems, Denver, built the spacecraft. 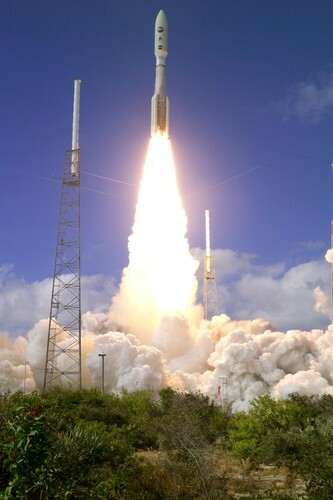 Launch management for the mission is the responsibility of NASA’s Launch Services Program at the Kennedy Space Center in Florida. JPL is a division of the California Institute of Technology in Pasadena. You can follow the mission on Twitter at http://www.twitter.com/nasajuno. NASA and Lego have some great resources for parents and kids as well as educators. Kids can join the NASA Kids Club to learn more about the organisation, space flight and space in general. Lego has a dedicated Lego Space page that has a whole heap of educational activities and downloads as well as more information on their partnership with NASA and the latest Lego space sets. All images courtesy and copyright NASA.